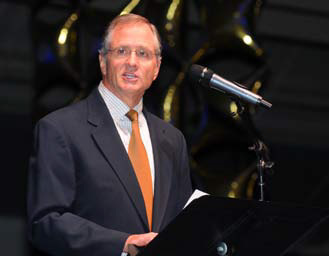 Richard Pumphrey delivering remarks at the "George L. Carter" portrait bust's dedication on the ETSU campus, 10 October 2011. A life-size portrait bust of Thomas Jefferson by Richard Pumphrey was dedicated this December at Thomas Jefferson’s retreat home, Poplar Forest, in central Virginia. The image of Bob Slaughter, who spearheaded the National D-Day Memorial, has become a permanent part of the shrine. ETSU’s commissioned portrait bust of George L. Carter (See October, 2011, below) by Pumphrey is featured as the back cover art on a biography entitled, THE LAST EMPIRE BUILDER: A LIFE OF GEORGE L. CARTER, 1857 – 1936, by Ray Stahl and Ned L. Irwin (copyright 2012). Among more recently completed sculptures is the portrait, “Drew at 3-1/2 years,” observed as the last image on the PORTRAIT SCULPTURE page (Touch the link at the left of this page). “Compromised: Zealots’ Glory, II” again selected for a juried exhibition. The pieces selected by the juror represent the variety and breadth of work throughout Virginia. The juror is Caroline Cobb Wright of the Visual Arts Center in Richmond. As noted below, “Zealots’ Glory, II” is the latest of the sculptor’s work, joining the “Compromised” series that addresses atrocities committed against woman. Photos of this work can bee see at the WOOD CARVINGS link, at left. The creation of this bust by Richard Pumphrey was one of the highlights of ETSU’s Centennial Celebration (2010 – 2011). This bronze sculpture is located on the campus of the Claytor Nature Science Center/Lynchburg College in Bedford, Virginia — commissioned by Sakina Claytor. To preserve the property located at the foot of the Blue Ridge Mountains and “Peaks of Otter,” Mr. Carter donated his 470 acres to the College for the education and enjoyment of current and future students, and friends of the College. Click the PORTRAIT SCULPTURE link to your left to see this sculpture in the clay state and installed. National Juried Exhibition Inclusion “Compromised: Zealot’s Glory, II” was selected by Juror Sammie Nicely for the 26th Annual Positive Negative National Juried Art Exhibition. The PN26 exhibition is from February 14 to 25, 2011 at the Slocumb Galleries at East Tennessee State University. This sculpture is the latest of the sculptor’s work, joining the “Compromised” series that addresses atrocities committed against woman. Photos of this work can bee see at the WOOD CARVINGS link, at left. Richard Pumphrey shares his views on closeting Stalin in today’s lead story in The News & Advance (New story, old photo). WVTF’s Keran Billaud talks both to history experts and the sculptor, himself. Stalin bust installed at D-Day Memorial — Lynchburg News Advance Richard Pumphrey, a Lynchburg College professor and artist, finished the piece last year . . . Residents and leaders in Bedford have spoken out against installing the Stalin piece at the memorial. STUDIO VIRGINIA. Richard Pumphrey, in his studio with host Libby Fitzgerald, discusses the Stalin sculpture for the National D-Day Memorial. Topic: Matters associated with the bust’s design and installation. EVENING EDITION. Richard Pumphrey and William McIntosh, the National D-Day Memorial’s Executive Director, speak with WVTF host Libby Fitzgerald about the Memorial’s financial future and Pumphrey’s sculpture. A sculpture of Soviet Union leader Josef Stalin by Lynchburg artist Richard Pumphrey will join the busts of Allied leaders (from left) Harry Truman, Franklin D. Roosevelt and Winston Churchill at the National D-Day Memorial in Bedford, Va.